SLS (Selective Laser Sintering) is an additive manufacturing method. It creates parts additively by sintering fine polymer powder particles, to fuse them together locally. Like in the DMLS or in the SLM technologies, your plastic part will be created layer by layer, according to your 3D model. A major difference is the sintering temperature. When Polyamide needs to be sintered at a temperature of 160°C to 200°C, thanks to a high-wattage laser, the metal laser 3D printing technologies are working at a much higher temperature. During the 3D printing process, the SLS machine preheats the bulk powder material in the powder bed somewhat below its melting point, to make it easier for the laser to raise the temperature of the selected regions the rest of the way to the melting point. A roller will apply a layer of polymer powder, then the laser will sinter the powder according to the 3D file and the build platform will get down before applying a new layer of powder... The process will be repeated until the desired part is created. Once it's finished, the plastic objects need to cool down before being extracted. Selective laser sintering (SLS) was developed and patented by Dr. Carl Deckard at the University of Texas at Austin in the mid-1980s, under sponsorship of DARPA. Deckard and Beaman were involved in the resulting start up company DTM, established to design and build the Selective Laser Sintering SLS machines. In 2001, 3D Systems, the biggest competitor to DTM and SLS technology, acquired DTM. The most recent patent regarding Deckard's SLS technology was issued 28 January 1997 and expired 28 Jan 2014. The Selective Laser Sintering SLS 3D printers that we are using at Sculpteo are coming from the German company EOS, which also is our first 3D printer provider. EOS Additive Manufacturing technology based on laser sintering has been in existence for over 20 years. The EOS P760 which has the biggest build chamber and is dedicated to the large parts. The biggest benefits of any 3D printing technologies lie in those areas where conventional manufacturing reaches its limitations. That is particularly true when it comes to Selective Laser Sintering (SLS). The laser sintering technology enables a design-driven manufacturing process - where design determines production and not the other way around. Thanks to our online SLS service, you can have access to professional 3D printers for prototyping and production, distantly, and without needing to worry about operating the machines yourself. You'll get your 3D printed plastic parts, fully functional and ready to be used or integrated into a larger object, within a few days. Selective Laser Sintering (SLS) as other metal 3D printing technologies is appropriate for manufacturing small batches at a reasonable unit costs and a high degree of product customization even in serial production. We have a strong expertise in the production of series with SLS technology. We are able to combine design, engineering and finishing skills in order to meet the requirements of your project. Your only concern will be to create the best design for what you want to do. 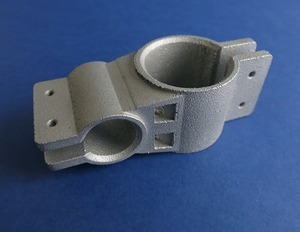 In contrast with some other 3D printing polymer technologies, such as stereolithography (SLA) and fused deposition modeling (FDM), which most often require special support structures to fabricate overhanging designs, Selective Laser Sintering (SLS) does not need a separate feeder for support material because the part being constructed is surrounded by unsintered powder at all times, this allows for the construction of previously impossible geometries. Since the 3D printer's chamber is always filled with powder material the fabrication of multiple parts has a far lower impact on the overall difficulty of the production. At Sculpteo we have developed our own 3D printing software in order to nest multiple parts in a single job. It helps us to position and optimize the number of parts to fit within the boundaries of the machine. However you need to respect some design constraints when you are creating your 3D model for Selective Laser Sintering. For instance, we cannot 3D print a hollowed but fully enclosed element. This is because the unsintered powder within the element can't be drained. We have detailed many tips and specific design guidelines on each SLS material page. For these 3D printing materials, you can have instantly a quote after uploading your 3D file on the upload page. We also provide other laser sintered polymers on-demand such as our Flexible Plastic (TPU), Flame-retardant nylon, polyaryletherketones (PEAK) or polystyrene. If you're interested in one of these materials, in bigger sizes, or specific finishes, please contact our sales department. We will provide you a quote and a complete study. 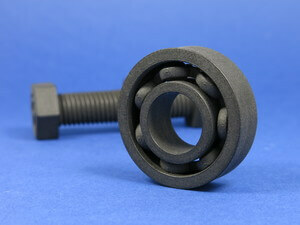 We also offer online 3D printing of black Nylon PA12, but using MultiJet technology (HP). To learn more about the HP method and materials, click here. Thanks to this plurality of 3D printing plastics you can choose the right one for your needs and applications. 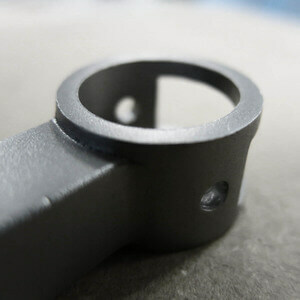 Selective Laser Sintering (SLS) is particularly useful to create unique plastic parts, that are fully functional, quickly available, and couldn't be manufactured with another technology. SLS part are strong and durable. The parts created with Selective Laser Sintering (SLS) have mechanical properties equivalent to most polymers. They are also lighter than injected molded parts. SLS functional parts are used for drones, robotics, special machinery, jewellery & watches, ioT devices, sport equipments, footwear, orthopedic technology, education or medical devices. Selective Laser Sintering (SLS) is a good technology to create architectural models and detailed concept models at a fair cost. EOS 3D printers are perfect for creating tooling because they combine high accuracy and good surface quality, you can use them for tooling for injection molding, for die-casting or for tool repair. For the medical device industry, there are several materials such as PA12, PA11 or PEBA that can fit medical norms and requirements. When it comes to applications in the medical sector, proof must often be provided of the origins and composition of the material used. Traceability and documentation is very important and provided by EOS. Laser selecting technology is also perfect for manufacturing prostheses or implants. As the patient's individual anatomy is the key factor, customization of the part is a great benefit provided by SLS technology. By granting access to new ways of manufacturing with plastics, Selective Laser Sintering (SLS) fosters innovation in those fields, as it might do in your field of application! The Sculpteo blog wraps up many case studies of startups and big companies that are using 3D printed plastic parts for prototyping and or for additive manufacturing. For a full case study about how 3D printing in general and Selective Laser Sintering in particular are revolutionizing the consumer product industry, the medical field, the fashion industry or construction, you can have a look at our Applications pages. We have also conducted a deep analysis to compare SLS technology to other traditional manufacturing process such as injection molding. You can download our white paper here. Sculpteo provides you the best online 3D Printing Services for your plastic parts. Thanks to our expertise in SLS technology, you can choose between several polymers and finishes and we will give you a quote instantly. If your project is very complicated and/or if you need specific finishes please contact our sales team which will try to find a solution with you. 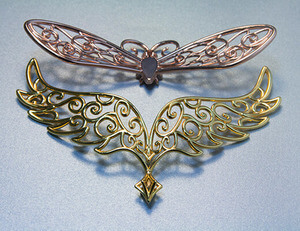 Selective Laser Sintering as other 3D printing technologies is appropriate for manufacturing small batches. That's why we are offering online a short-series quoting tool called Batch control, with a special pricing for your additive manufacturing needs. For 3D prints in different colors and finishings in Nylon, you must fill out a request with our sales team. It’s an easy process, just fill out a contact form. SLS polyamide materials are adapted to at-home post treatment. Thus, if you accept to take the requested time, you can easily make your own finishes on your object: polishing, dyeing, painting, varnishing, and more. For at-home finishing and polishing techniques, we invite you to take a look at our tutorial on finishing polyamide parts. Being both flexible and solid, this material offers high versatility. The surface has a sandy, grainy surface that can be polished. More than 10 dying colors and various finishes (like the Smoothing Beautifier) are available for our Nylon PA12 material. This Nylon (polyamide 11) is a bio-plastic and is made from black powder. It offers a continuous coloring that is resistant to abrasion. It is more brittle than the White Nylon PA12 material. Our Grey Nylon is a mix between PA12 and PA11. Parts are made from grey powder which offers a continuous coloring that is resistant to abrasion. This 3D printing plastic offers stiffness and flexibility as other polyamides. It is a good choice either for prototyping or for additive manufacturing. Glass-filled Nylon is a polyamide powder mixed with glass beads. It is stronger and more durable than other Nylon 3D printing materials but it has a less accurate printing resolution. This thermoplastic is a good technical material. This material is a mix between polyamide powder and small aluminum particles. The objects are solid but can withstand only minor impacts. The 3D printing material is somewhat porous with a light aluminum sheen. Alumide is available in 5 different colors. CarbonMide is also a mix between black polyamide powder and carbon fibers. This 3D printing plastic has a great resistance and offers the best weight/strength ratio. The main application is mechanical parts such as aerodynamic prototypes that can be used in many industries. PEBA 2301 is a Polyphthalamide from the 3D printing nylon family. Its surface is similar to rubber ad it is made from an off-white powder. It offers great resistance to stress and fatigue, and is compatible with many chemicals. The shoreness of PEBA 2301 is around 85A. Flexible plastic is softer than the PEBA 2301 but it is less resistant. The parts are off-white and the shoreness is around 70A. The Flexible plastic is best for prototyping than for production parts. The surface of this 3D printing material is porous.